Almost six years ago, I was diagnosed with stage 1 thyroid cancer. I didn’t want to believe it because I was young (20 years old), healthy, and active. I went through a roller coaster of emotions—I was scared, sad, and angry. But I couldn’t just stop and be depressed because life won’t stop for you no matter what. I made every effort to surround myself with positive energy from my family and friends. After my treatment, I found that the ocean was great therapy for me. Having my feet get wet, hearing the waves, smelling the salty air, and feeling the sun soothed my spirit. The underwater session was a great experience! I was able to let myself feel free and create art with my body. It’s amazing how you can feel clarity when underwater. The result of the shoot displays a powerful photo of a person who has survived a unique and tough battle. 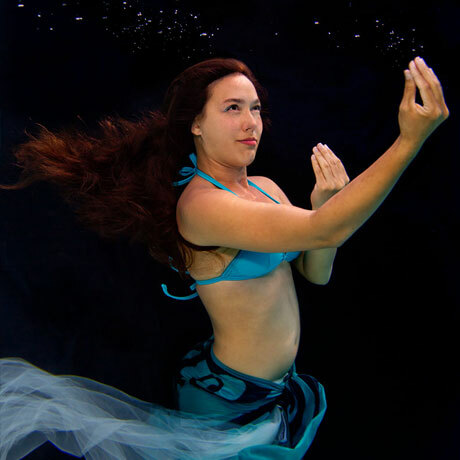 This is my third time meeting artist and free diver Kimi Werner and doing an underwater photo shoot with her. While I was on vacation in Maui, Kimi told me about Amber Noelani Wong [see previous page], her soul sister who enjoys surfing. The story of how Kimi and Amber met is so interesting! While Kimi was reading Amber’s cancer story in Makai, a local Hawaiian magazine that features ocean sports and people connected to the ocean, she received an email from Amber about a hand-painted hat order! (I have one of Kimi’s hand-painted hats, too.) Amber thinks that it was fate that connected the two of them this way. I instantly made the spontaneous decision to join both of them in Oahu to do this shoot. We all had an amazing time. Our Aloha love triangle was connected through water and Kimi’s hats.